Composer of the Month. Each month at Marin Piano Studio we study a different composer, relative to the period of music we are studying. 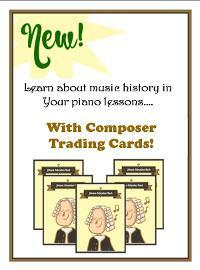 Students collect Composer Trading Cards, one for each composer unit completed. During our frequent Piano Parties we discover fascinating facts in music history. From an overview of the Classical, Baroque, and Modern Eras, to studying individual composers, audio formats and composition, these classes are all about having fun while learning. We hope you can join us at our next Piano Party! Watch for the next newsletter with information about our next event!